Every so often one amazing person connects me to another amazing person, and we usually listen to the universe and become friends. In this case, Jane is loved to pieces by my kindred-spirited friend Lin, who frequents Atlanta often. The more I get to know Jane, the more I’m tempted to fly out just to have ice cream on a day that she’s working at Bruster’s Ice Cream Shop! This last week, I had an exclusive virtual interview with Jane to see what she’s made of! 1. Tell me a little about yourself, what’s your life philosophy that led you to BuildOn, and why did you get involved with BuildOn? I’m a Japanese language and Classical Culture dual-major at The University of Georgia. It has always been important to learn about various cultures around the world. There are two causes—AIDS awareness/prevention and Universal Education—that strongly drive how I’d like to work and live my life. Learning about BuildOn at UGA provided me with the means to start advocating and funding education for children around the world. BuildOn has become so important to me because education has always been very dear to my sister and I. When we were in elementary school, my mother went to extreme lengths as a single parent to move us into an exceptional education system, one that allowed us to fully and more freely explore our educational strengths. To this day, I can never thank my mother enough for her sacrifices for our education, so I want to help many other children have access to education. 2. Who inspired or motivated you to take on this project? Why? I remember the night the story broke, headlines cluttering the screen, “14-year-old Girl Shot by Taliban for Attending School.” Before that moment, I had no idea who Malala Yousafzai was, no idea that she had been working towards girls’ education in Pakistan for years prior; all I knew was that I was also a 14-year-old girl with a passion for education, and I felt an instant inspirational-connection to her. Over the years, I have kept up with Malala’s advocating for education for all boys and girls. Knowing that she had built a few girls’ schools in Africa, I was inspired to build with BuildOn because I knew that building with this wonderful organization was a sure way to help spread boys’ and girls’ literacy in other places in the world. 3.  How much did you fund-raise and how did you do it? This past year was the first year of UGA’s BuildOn chapter, so I was one of three active club members. Between us, we raised around $3,000. We raised money by making personal donation pages from BuildOn’s website, and every donation we received online went directly to our chapter’s fund. Very early on, we decided to fund a school in Nicaragua. We wanted the fund-raising to be a bit more personal to our ultimate school in Nicaragua, so we also raised money by selling coffee that was local to our Nicaraguan Community, Dipina Central. By raising funds like this, the community received money for selling the coffee to BuildOn, and then received money towards their school for every coffee bag of theirs we sold—We were able to bring money back to the community in two different ways. After raising money for BuildOn, members have the opportunity to travel to the build-site and assist with building the school. One member can be sent over for every $2,000 raised by the chapter (The money raised goes directly to building supplies, we were responsible for buying our own fares to the country). Our Chapter had only raised $2,000, so we could only send one person. To my surprise, the founder of this chapter chose me to be our first member to build, and I was the only student from UGA, alongside students from other Universities, to go on the Nicaragua trek. I was completely humbled and thankful for my chance to travel to Nicaragua to help build the school! 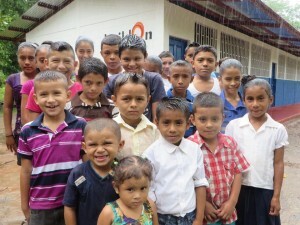 …The village boys and girls are now attending class in their new school. 4. Then you went over and helped build a school! What was that like? The first culture shock came immediately after arriving to the village, when I was hunting for the nearest bathroom (we had been driving for about 6 hours). I discovered in the middle of a field something I had never seen before: a latrine—nothing more than a round hole sitting above a ten-foot ditch. This was hard to ge t passed at first, but after about 2 days in the village, none of us gave it a second thought. 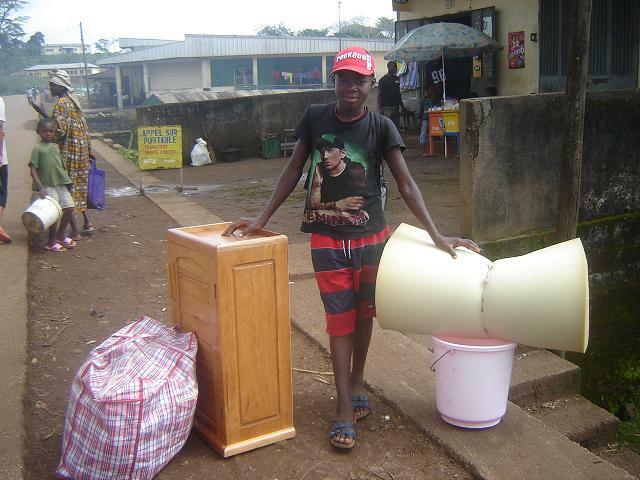 The Village had no electricity, plumbing, or a fresh water source. These were the things, however, we even forgot about as we were living and working in the village. Our team consisted of twelve college students-one trek leader, two translators, and a BuildOn photographer. None of our team had any construction experience, like many of the villagers, so we were led by a local Nicaraguan BuildOn contractor who assigned us all jobs daily. We helped build in the village for ten days. 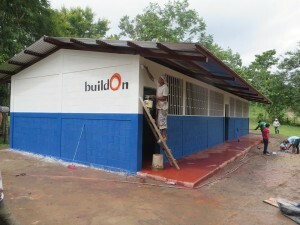 The community finished the construction of the school 4 weeks after we left Nicaragua. 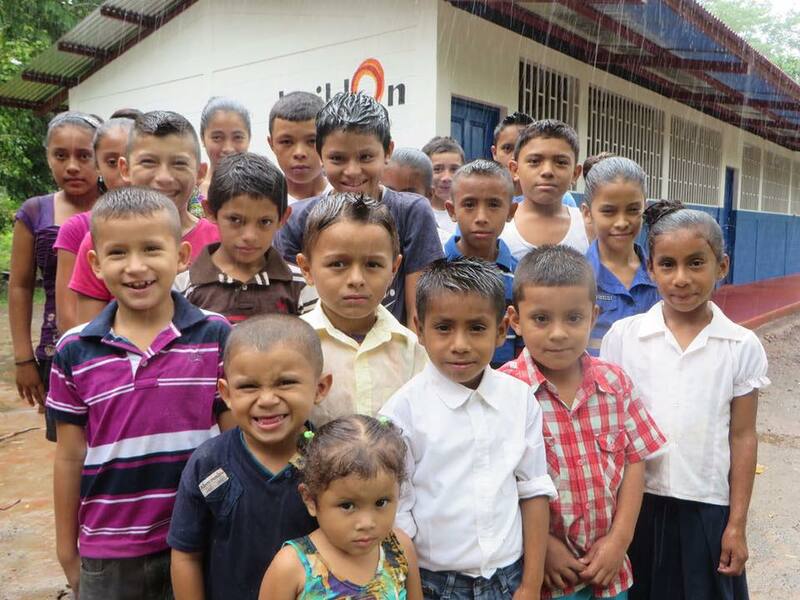 Through updates the contractor has sent us, we know that the village boys and girls are now attending class in their new school under professional teachers, which BuildOn Nicaragua helped provide. 5. What’s the impact of this particular project? I am certain this school will improve the living condition for the community. Our program doesn’t stop after the school is finished being built. With State Department certified education in the school, the boys and the girls are encouraged to stay in school longer. Many of the village mothers told me they had dropped out of school around or before the third grade, so that they could help out at home and, in some cases, get married and have children. A few of them said they regretted that decision, saying they had wished they could have continued their education. 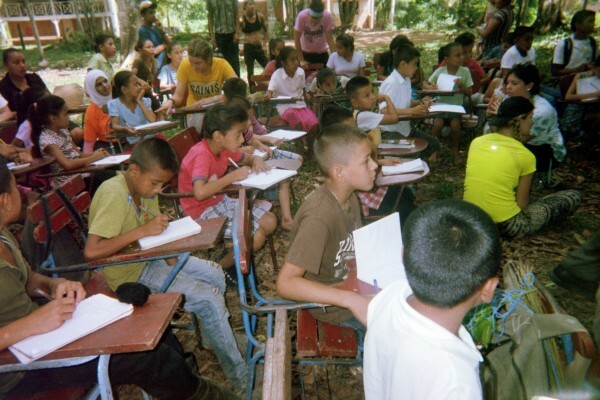 By helping make Dipina Central a literate village, they will have greater access to jobs on account of their education, and being more educated will help the families of Dipina Central escape poverty. 6. How did the locals receive you? What parts of the trip left an impression on you? Why? All of the village houses had a front door (technically), but you never would have known that, as I wokeup every morning and found a good portion of the neighbors walking in and out of our one-room home. The community welcomed us whole-heartedly, and they were so patient with me, even though I arrived with no knowledge of Spanish. This language barrier was put to the test the first night we arrived, when I was outside of the house playing with a bunch of the little neighbor kids. The only way they could teach me how to play the games was to act it out as they were explaining the rules; I paid very close attention. The next thing I knew, we were all grabbing each other’s hands, and dancing in a circle, a game that played out to be a kind of hybrid between Ring-Around-the-Rosie and Red Rover. We were all laughing and having so much fun playing that game, I had forgotten that I could not understand what they were saying. We were able to connect on such a deep level, despite the language barrier. When speaking to my host father one afternoon, I learned that he didn’t have a job. When I pushed for more info, I found out that on Saturdays, he would travel 2 hours to the nearest city to take middle school classes so that he could find a job to better support his family. My host family was poor and did not have much for themselves, but I was so thankful that they welcomed me with all that they had, including all of their love. I was inspired by the length my host father went to get an education, and I hope the best for his daughters and theirs! 7. What’s next for you, and what’s your next project? I plan on doing BuildOn again next summer—it was such a life-changing program for me to be part of! My immediate goal for this upcoming year is to grow our chapter from 3 people and reach a great level of support! 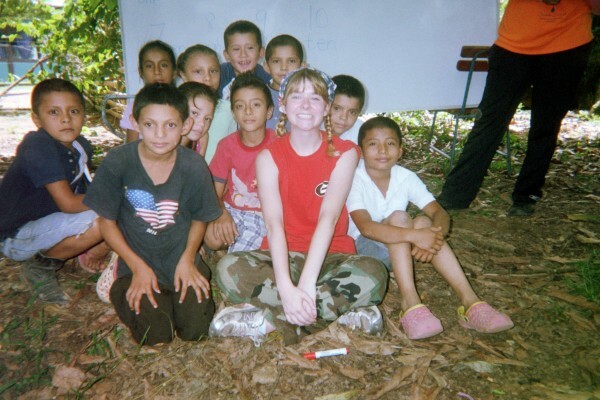 But individually, I am also raising money through UGA for next summer’s build project. We hope to reach so many people this year at UGA! 8. What can we do to get involved? How can we help you reach your next goal? If you are in high school or at a university, check around to see if your university is involved with BuildOn. If not, start up your own chapter—they’re easy to start up and can help change many lives! If you aren’t in school, check around your community to see if there are any BuildOn activities. BuildOn is a non-profit, so there are many ways to get involved not only abroad, but also through many domestic programs that help at-risk youth. My personal goal for this upcoming year is to raise $2,000 on my own! This seems like a hefty task, but I have a job where I work for tips, and I have been saving up my tips and putting them towards this fundraiser! Please visit my fundraising page to read about my story and goal, spread it, and help if you can! Finally, consider joining BuildOn—it’s a wonderful Organization to work with and it’s so easy to change the world with BuildOn! On their About page, Bruster’s Ice Cream Shop says they make real ice cream the way ice cream should be made. 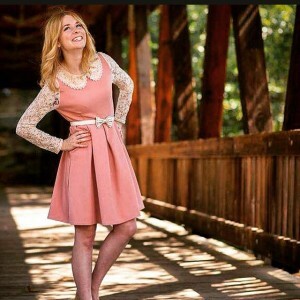 Interestingly, the company employs one sweet girl who keeps it real and is made of good people! Jane reminds us that in a struggling world, one girl and one dream can change the world.